Nigel's promotion of Nigel has always been , at best , cringeworthy . Did poor Mrs May pick up her terrible sore throat from kissing Junky Junker ? Did he do it on purpose... ? Germ warfare..! My Mam always warned me that French kissing leads to trouble. 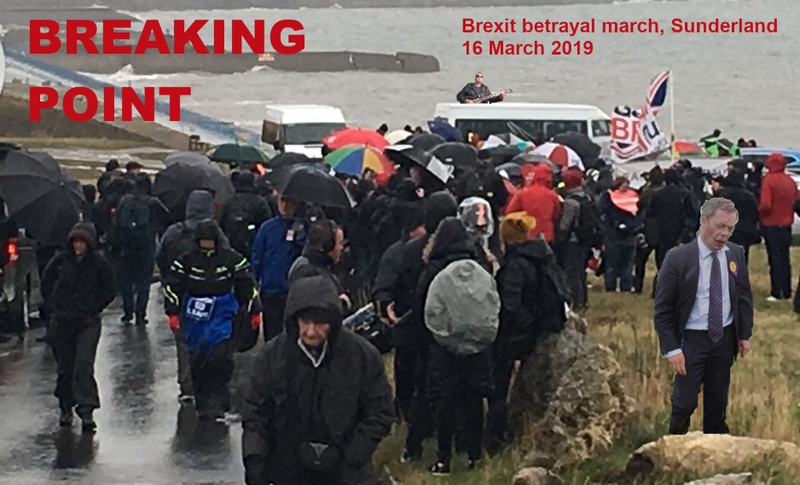 I saw an image of the start of the march near Sunderland on Saturday and it reminded me of the disgusting racist image promoted by Farage back in 2016 so I fixed it for him. I almost had sympathy with them in that weather and with the miserable attendance until one of the blokes punched a female remain supporter in the face for filming them. And some truckers I know have said they will roll down the a34 in first gear at low revs side by side, to disrupt traffic, but that corrupt bbc probably won’t report on it. John h, will you be reporting on the March 29th leave campaigners in parliament square? There be a few more than 350 thousand for you to laugh at. The people have voted, so put ya dummy back in and go with democracy.